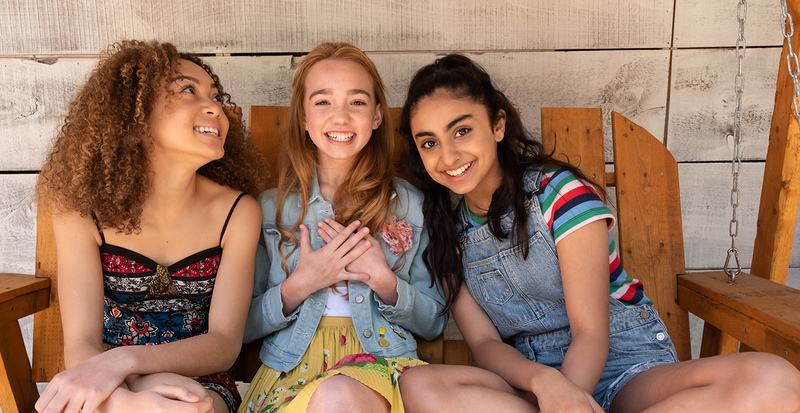 Toronto, January 8, 2019 – This weekend, Family Channel is giving fans a double dose of friendship, laughter and heart as the new series Holly Hobbie premieres as a two-day television event on January 12 and 13 at 11:30 a.m. ET/PT. Inspired by the American Greetings character first introduced in 1967, the tween drama stars up-and-comer Ruby Jay as 13 year-old Holly Hobbie, an aspiring singer-songwriter who lives with her family on a farm outside small town Collinsville, U.S.A. Those who can’t wait to catch a glimpse of the show, can stream the first episode on the Family Channel App (available now on advance free preview), or visit Family Channel’s YouTube page for exclusive behind-the-scenes video content. Kamaia Fairburn, Ruby Jay and Saara Chaudry star in Holly Hobbie, premiering January 12 on Family. Filmed this summer in Hamilton and Toronto, Holly Hobbie centres around a passionate young girl who isn’t afraid to fight for causes she believes in, even if it ruffles feathers. She loves spending time with friends and family, writing songs, or riding her horse. But when Holly sees people in trouble, or wrongs that need righting, she has to step in. Both a dreamer and a doer, Holly navigates friendship, young love and family conflict with a positive attitude and authenticity. She may plan on saving the world some day, but for now she is happy to start at home. In the series premiere, debuting on Family on Saturday, January 12 at 11:30 a.m. ET/PT, Holly finds out that her grandma’s café might have to close for good and attempts to save it by hosting an open mic night. Then, in the second episode, on Sunday, January 13 at 11:30 a.m. ET/PT, Holly gets jealous when she discovers that her friends Amy (Saara Chaudry, The Breadwinner) and Piper (Kamaia Fairburn, Star Falls) are trying out for cheerleading together, so she tries to sabotage their developing friendship. Following the two-day event, new episodes of Holly Hobbie will continue to air Sundays at 11:30 a.m. ET/PT and will be available on both the Family Channel App and Family OnDemand. Fans interested in learning more about the series and its cast, can check out Family Channel’s YouTube page for some amazing new videos! The Next Step’s Briar Nolet welcomes Ruby Jay to the ‘Family’ with an up close and personal interview, featuring rapid fire questions and a fun game of “this or that.” Meanwhile, The Next Step’s Myles Erlick shows off his vocal chops, performing alongside Ruby Jay in a collaborative cover video of the Golden Globe winning hit song “Shallow,” that no one should miss. Fans are encouraged to check back regularly, as new content will be released throughout January. Holly Hobbie also stars Hunter Dillon (The Exorcist) as Tyler Flaherty; Charles Vandervaart (The Stanley Dynamic) as Holly’s brother Robbie Hobbie; Kate Moyer (Our House) as Holly’s sister, Heather Hobbie; Erin Karpluk (Saving Hope) as Holly’s mom, Katherine Hobbie; Evan Buliung (Reign) as Holly’s dad, Robert ‘Bob’ Hobbie; and Sara Botsford (Ride) as Holly’s grandma, Helen Hobbie. Produced by Aircraft Pictures in association with Cloudco Entertainment with the financial participation of the Shaw Rocket Fund and Hulu Originals, Holly Hobbie is executive produced by showrunner Sarah Glinski (Degrassi: Next Class, Degrassi: The Next Generation), alongside Karen Vermeulen, Ryan Wiesbrock and Sean Gorman of Cloudco Entertainment (Tinpo, Buddy Thunderstruck and Care Bears), Matthew Wexler of Wexworks Media (D.N.Ace, Paw Patrol), and Anthony Leo and Andrew Rosen of Aircraft Pictures (The Breadwinner, Bruno & Boots: This Can’t Be Happening at Macdonald Hall). Family Channel offers the best in family television entertainment in a premium, high-definition, multiplatform environment. Dedicated to celebrating family life and providing opportunities for the whole family to gather and watch together, Family airs a unique mix of top-rated Canadian and acquired series, movies and specials. Family Channel subscribers have access to the Family Channel App, Family OnDemand and Family Online at no additional cost, to see hit movies and series when they want them, where they want them. Visit us at Family.ca. DHX Television is composed of Family Channel, Family CHRGD, Family Jr. and Télémagino, and is part of DHX Media Ltd., a leading creator, producer, marketer and broadcaster of family entertainment. Dedicated to celebrating family fun, DHX Television delivers best-in-class programming through premium subscriptions and its original production mandate, and creates and produces captivating in-market events that appeal to Canadian families. DHX Television is home to world-renowned series including The Next Step, American Ninja Warrior Junior and Mega Man: Fully Charged. DHX Media Ltd. has offices globally, and is traded on the NASDAQ and Toronto Stock Exchange.